Cargo (or freight) is goods or products transported, generally for commercial gain, by ship or aircraft, although the term is now extended to intermodal train, van or truck. Different cargo types by sea, air and rail depends on what’s the most cost-effective way. Here’s basic rules not only applied to transport from China, but to the whole international logistics industry. Currently, shipping volume is accounted for 80% of total international transportation, and containers are used in most long-haul cargo transportation. Sea transportation is not like trains, cars which are limited by rails and roads, it has an extensive natural waterway to carry the goods which makes its ability to a high level. Vessel transport capacity is far greater than the rail transport and cars. For example, a 10 thousand tons ship is generally equivalent to the load capacity of 250 to 300 wagons. Automobiles are usually carried on specialized roll-on/roll-off ships. Break bulk cargo is typically material stacked on pallets and lifted into and out of the hold of a vessel by cranes on the dock or aboard the ship itself. Bulk cargo is usually defined as commodities that are neither on pallets nor in containers. They are not handled as individual pieces, the way heavy-lift and project cargoes are. Alumina, grain, gypsum, logs, wood chips, etc. are bulk cargoes. Containers are the largest and fastest growing cargo category at most ports worldwide. Containerized goods includes everything from auto parts, machinery and manufacturing components to shoes and toys to frozen meat and seafood. In accordance with the view of scale economies, as the large volume, long distance, sharing transportation costs per unit is very low, then total freight rate is low relatively. Although sea transport has above advantages, but there are also some inadequacies. For example, sea transportation delayed by climate and natural conditions, shipping date is not so accurate as trains and is more risky. In addition, sea transport speed is not as fast as trucks or trains. Learn more about China ocean freight here. 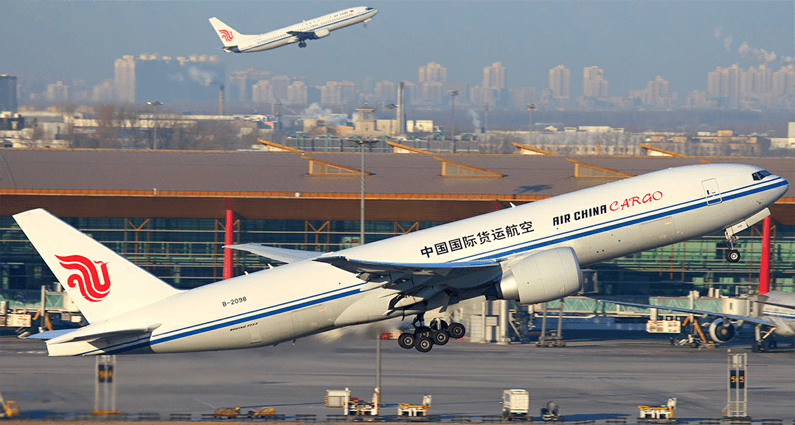 Air cargo, commonly known as air freight, is a modern mode transportation, compare with sea transport, rail transport, it has the advantages of fast transport, high-quality, and not limited on ground conditions. Of course it cost more. It is the most suitable way for delivering urgently needed supplies of fresh goods, precision instruments, valuable goods, etc. In just about all businesses, time is money. So, does the higher cost of shipping by air get diffused by the increase in speed? Also keep in mind that as we move forward, technology is consistently making shipping by ocean faster. This is happening through better vessels, faster management resources and more accurate communication. If interested in China air freight, you can find more here. They are used because they can carry a large amount and generally have a direct route to the destination. Under the right circumstances, goods transport by rail is more economic and energy efficient than by road, especially when carried in bulk or over long distances. If rail freight from China to Europe, it will save about 70% than by air, while the transit time will be shorten 50% than by ocean. There are many advantages of railway transport, generally it’s not influenced by climatic conditions, so it can ensure an annual normal transport, and loading is larger, speed is fast, high continuity, and less risk during the transport operation. The main disadvantage of rail freight is its lack of flexibility. For this reason, rail has lost much of the logistics business to road transport. When you have goods to transport, the first thing is to determine the cargo types and find what’s the most suitable way for delivery. Let us know your thoughts, please.